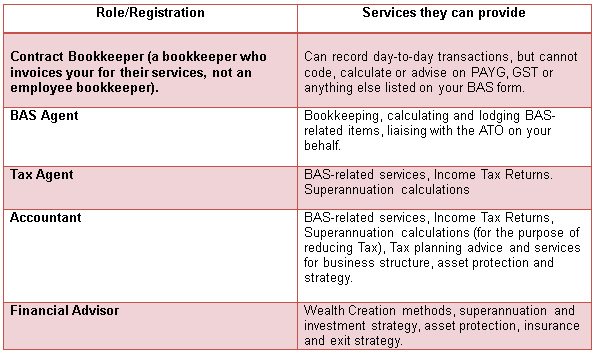 JBS » What’s the difference between a Tax Agent and an Accountant? What’s the difference between a Tax Agent and an Accountant? And what is the difference between an accountant and a BAS Agent? Make sure you understand which financial professional to turn to. Owning a business involves making hard decisions. Should I advertise my business more? How much finance should I get to buy more machines? Will my workers cope without me during my business trip to Fiji? Common sense would dictate that you get the best information possible so you can make the best decisions for your business. In Australia, it is common for individuals to use a tax agent to lodge their personal tax returns. But when it comes to running a business, the involvement of an accountant is crucial in ensuring you make the right choices when it comes to tax planning, business structure and growth. Tax agents are highly specialised in preparing and lodging Income Tax Returns. Tax Agents focus purely on Income Tax; how much income you have to declare, and how much you can claim back from the ATO. This is distinct from an accountant, who is more concerned with planning and strategy, and would prefer to meet with you at least twice a year to review your tax position and structure. An accountant’s role revolves around assessing and advising you on what actions to take to maximise your income tax. Nearly every financial move you make has some level of taxation involved, so it makes sense to have the advice of an accountant on hand. A great Accountant should seek to be informed about the direction you want to take the business and more importantly, be involved in how you intend to get there. This means ensuring you are trading with the right entity structures (should you trade as a Sole Trader or form a company? ), strategically planning how (and when) you make large purchases (eg. equipment, vehicles etc) or changes within your business and ensuring you meet any additional taxation obligations (for example, fringe benefits tax, import tax etc). He or she will also supply you with clarity on what expenses you really can claim against your income, and work harmoniously with your BAS Agent or bookkeeper to make sure these decisions are reflected in your day to day financial records. BAS Agents are focused on your day-to-day financial tasks, including bookkeeping and BAS lodgements. With the introduction of the new BAS Agent legislation in 2010, if you are a GST-registered business, you’re money is best spent on a great BAS Agent to prepare your financial records and manage BAS calculations. BAS Agents also offer insight into the best practice preparation of your financial data, making it easier for your Accountant to provide their advice and services. Accountants love a bookkeeper who does their preparation for them – and at the hourly rate they charge, you’d probably prefer to find a good bookkeeper than force your Accountant to sit in the corner doing data entry all day. Whilst the service is usually offered, many Accountants prefer not to be involved in the bookkeeping side of your business. If you are using the services of a BAS Agent or bookkeeper, encourage your Accountant to keep them in the loop with your tax planning. Likewise, your bookkeeper should touch base with your Accountant throughout the year to ensure that any major transactions are treated appropriately for taxation purposes. Finally, if your bookkeeping is up to date, your reporting is more accurate, and your Accountant can advise you based on real data (not “guesstimates”). So where do financial advisors fit in? They are a must-have resource for those who truly want to ensure a financially sound future. A financial advisor is focused your financial big picture. Contrary to popular assumption, you don’t need to be wealthy to engage a financial advisor. If you are in partnership, the right insurance is critical. Have you considered your options should a tragedy strike you or your business partner? It’s an awful thought, but this is the reality of being in business. A financial advisor seeks to protect your income streams and provide input on the right entity structure to bring everything together. This means adequate protection of your assets, minimising risk and liabilities, ensuring you have a sound exit strategy in place for retirement or moving onto your next project. It’s important that your financial advisor and accountant are in communication to ensure your well-laid plans stay that way. Of course, some of these professionals offer a combination of services. There are BAS Agents who bookkeeping services, and accounting firms who provide financial advice (just check they are registered to do so!). However, it’s not always best practice to put all of your eggs in one basket. There’s no substitute for quality, even for multi-service discounts. So surround yourself with a team of specialists, be involved in the process and encourage clear communication between your specialists – their services and advice are only as good as the information you give them.